Residents are upset that they have to pay $30 to have DWP workers investigate their claims that they were unfairly charged. Customers of the Los Angeles Department of Water and Power are feeling pinched, after being told they have to pay a fee to investigate bills they claim are unfair. "I'm actually very thoughtful and water conscious," said LADWP customer Amy Russell. But that wasn't enough to keep the Silver Lake teacher's utility bill from going through the roof without explanation last spring. "All of a sudden in April — pow!" she said, pointing to the bill, which topped $700 — triple her regular rate. "It's crazy." 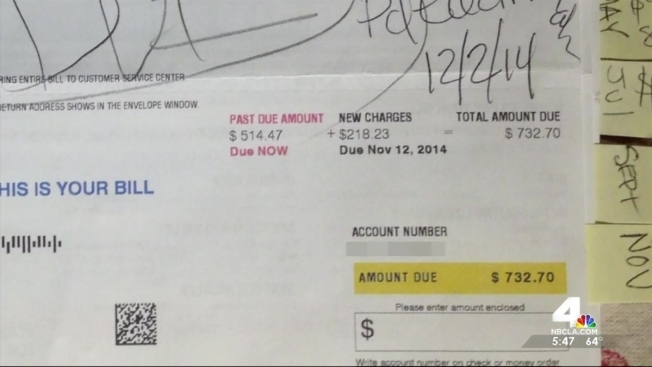 Her unusually high bill coincided with the meltdown of LADWP's new billing system, which was launched in September 2013. For months after, thousands of customers received no bills or were charged inaccurately high amounts. "In order for me to have used the amount of water they say I used, I'd have had to flush my toilet 30,000 times more than usual," Russell said. "Or I would have had to irrigate for an extra 150 hours. Or my kids would have had to take 15,000 extra showers." Her efforts to solve the problem resulted in endless emails and phone calls, one lasting more than three hours. Still, the bills kept coming. Fearful that their water and power would be switched off, Russell and her husband paid it. They hope for a refund. "[She said] if you'd like an investigation, you'd have to pay us $30. To investigate their mistake." In downtown Los Angeles, the LADWP's top managers appeared before the LA City Energy and Environment Committee, which is chaired by Council Member Felipe Fuentes. When asked about the $30 fee, Randy Howard, the senior general manager of the LADWP, said there are standing charges for different services. "And there is a particular charge, so if a customer contacts us and says, 'I have some concerns with my bill. I'd like someone to come out and check my meter. I think my meter might be wrong,' well, there is a $30 charge if we go out and find the meter is accurate." Russell hasn't decided if she'll pay the $30 fee, which she considers yet another DWP injustice. "I'm infuriated. I'm so frustrated. Something has clearly gone wrong. They need to not just put their PR people to work, but they actually have to help customers."